Mum went to Iceland! Mum-of-three Clare Ash says she felt helpless when her cousin was diagnosed with cancer, so signed up for Weldmar Hospicecare’s Iceland trek to feel like she was doing something positive. A few years later and she’s raised nearly £12,000 for Weldmar, having been bitten by the fundraising bug and having seen some of the work they do for patients and their loved ones. Clare, 46, is from Chickerell but now lives in Redlands. She lost her mum Carol-Ann Hains in July, and this has spurred her on to raise even more. 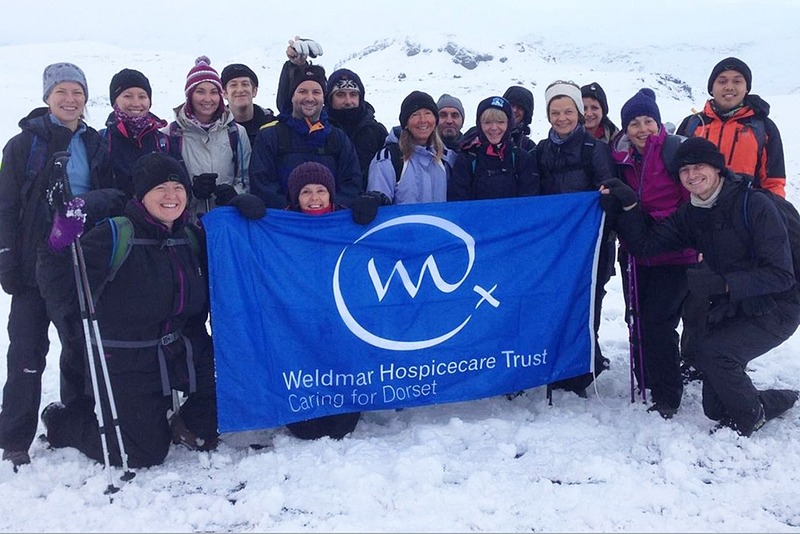 She said: “I took on the Iceland trek for Weldmar because, although my cousin was in Warwickshire, I wanted to do something for a hospice and it felt right. My courageous cousin Wendy Blackman was always seeking her next adventure and Iceland was on her places to go list – I only learned this once I signed up to take part. “Iceland was an incredible experience as the terrain was so varied, challenging and yet therapeutic. I felt overwhelmed by how privileged I was to see the exceptional Northern Lights and at the same time raise money for Weldmar. I saw them twice in the ten days we were there and I was like a kid with the snow. I was so excited, and made a snowman and everything! “I felt so angry and frustrated when she was fighting cancer and needed something to do that would help. It was an amazing experience. I made some great friends – we all had so much in common. Clare, also known as ‘Clarey Fairy’, has organised a garden party and sponsored walks as well as themed bingos and fancy dress 80s nights in Chickerell, following in the footsteps of her mum, who was instrumental in fundraising for Chickerell’s Willowbed Hall and fought to get the area a youth club. She’s now forming plans for an event in Carol’s memory, called ‘Mamafest’ – a family fun day with music, refreshments and plenty to entertain. She said: I’m excited and delighted to continue my fundraising mission as I passionately believe Weldmar is an invaluable and worthy cause. We would have loved mum to go into Weldmar’s care, but she got so ill so quickly there was no time. “It’s a wonderful place – calming, not clinical at all. People are made so comfortable and you can visit people at any time. It’s a home from home. And there is so much extra offered, such as family support, support for children. They will do anything to fulfil people’s wishes and make special memories for them. Weldmar has some places still available for their October 2018 overseas challenge to Nepal – which includes two days making a difference at a Kathmandu hospice care facility. You can learn more online about the Nepal Trek now, or call Fundraising on 01305 261800.